Perfect to practice possessives, adjectives and Yes/No Questions. 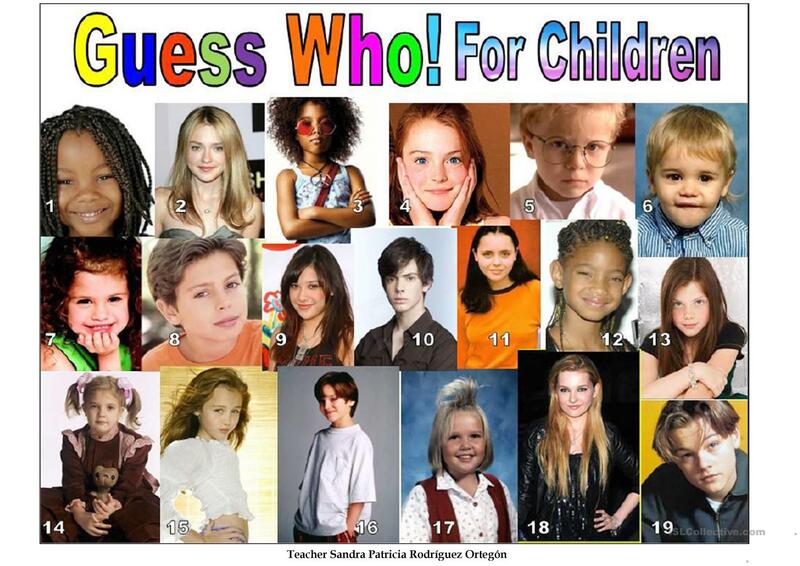 Instruction: Give each group of students a "Guess Who For Children" card. Ask each group to secretly choose a person from the picture. They will have to take turns to make yes/no questions to other groups so that they can guess the number of the person the other groups chose. Sample questions: Is it a girl?, Is her hair blond? Does she have braids? Is she wearing a red blouse?, etc. The winner will be the group that guess the person by making fewer questions. They also can guess who are the children in the picture. Most of them are famous actors when they were children. The above printable, downloadable handout was created for high school students and elementary school students at Beginner (pre-A1) level. It is aimed at teaching Adjectives in English, and can be used for improving your groups' Listening and Speaking skills. It features the topic and words of Describing people. creativeenglish is from/lives in Colombia and has been a member of iSLCollective since 2012-06-12 04:06:10. creativeenglish last logged in on 2018-10-04 03:15:04, and has shared 4 resources on iSLCollective so far.